This 16" length necklace, just restrung on silk, dates to 1910-1920 There are 79 natural Mississippi pearls, beautifully matched for color and shape. To assemble the pearls for this necklace would have been no mean feat! The pearls have fine luster, with many showing pink, gold and blue-green orient as you turn them in the light -- something not captured in the photos. (The photos show the necklace under indoor lighting, and natural light.) The original platinum fish hook style clasp features millgrain detail, and a diamond of approximately 2 points set on each side. Essentially, this necklace is an American version of the classic graduated saltwater natural pearl necklace. The expert who evaluated it had never seen the like, and doubts she will again! It would be a worthy addition to a collection of antique American pearl jewelry. 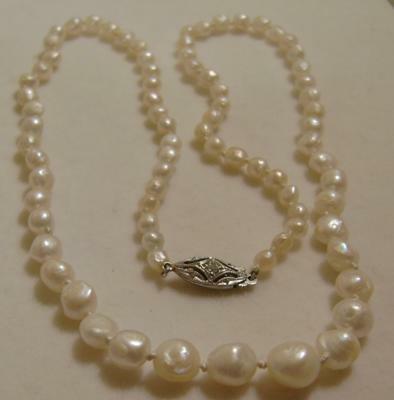 Would you be interested in a vintage antique natural Mississippi freshwater Pearl Necklace . It has two rows of pearls, a big gold brooch in form of a flower and it was bought in Puerto Rico in Cooper's jewelers which stood in the Old San Juan for sometime. I am looking for a pair of earrings. Antique natural Mississippi fresh water pearls. They have to be white and baroque. Size 7-8 mm. 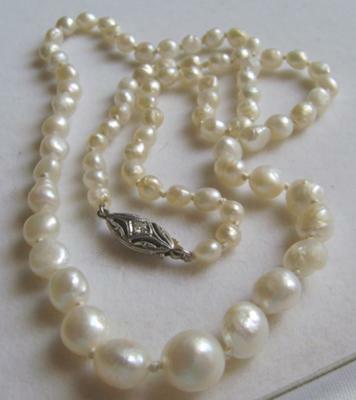 Return to Listed - Antique Natural Pearls & Jewelry - SOLD.